The pop-up store opened last night at Fortnum & Mason, and several readers headed for the new batch of Everyday Denim fabric, which was nice to see. The one I have in it (pictured) remains my absolute favourite shirt. 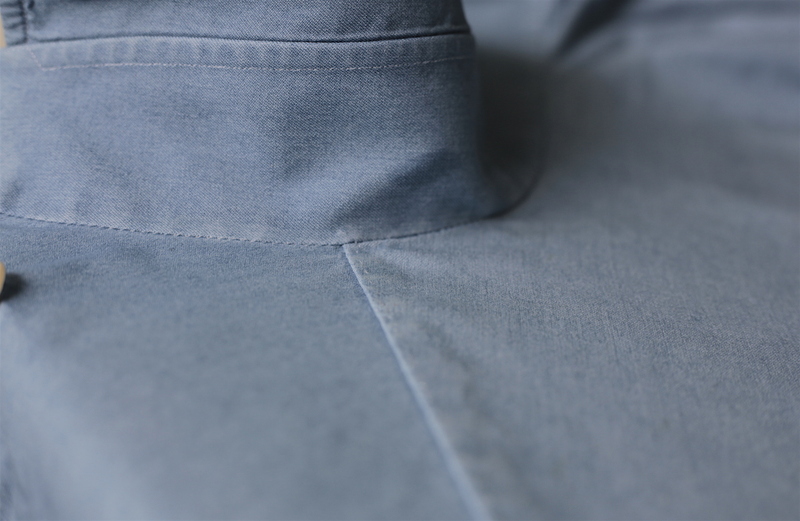 That denim is now available online as well - on the Shop site - for readers to buy and take to their shirtmaker. One thing I should note is the cloth has two sides: a face and a reverse. This is common to most denims, and it is the darker side that is the face - your shirtmaker should keep this on the outside. Most makers won't have a problem with this, but a couple of readers did ask last time, so I thought I'd make it clear. One relatively new reader did also comment that the denim he received seemed darker than the photos. This is because it is intended to fade - indeed, that's is the main selling point of the fabric. This is the reason we began offering the fabric originally. It was my favourite denim because it faded, particularly around the seams and edges, and therefore looked more like a ready-made, garment washed denim shirt over time. We began offering the fabric ourselves when it was no longer available elsewhere. Ready-made shirts in the fabric have also been available (for those that can't reach a shirtmaker) but are now largely sell out. Another batch will be available later in the year. By the way, if you want the fabric sent to a particular shirtmaker, please put them down as the delivery address and contact them separately to make sure they know it's coming. This fabric is all now sent from the UK too, so there will be a normal shipping charge if it's going to someone in Naples. You can follow the discussion on Everyday Denim cloth – new batch! by entering your email address in the box below. You will then receive an email every time a new comment is added. These will also contain a link to a page where you can stop the alerts, and remove all of your related data from the site. I know it’s impossible to predict, but I was planning on swinging by the pop-up next weekend. Do you think that the denim lengths may sell out by then, or should you still be good for stock? You should be fine Jonny, there’s quite a lot. See you then! Hi Simon, perhaps a stupid question but does Luca Avitabile have access to the cloth directly, I do I need to purchase the cloth separately and send to him? Not a question, comment really. 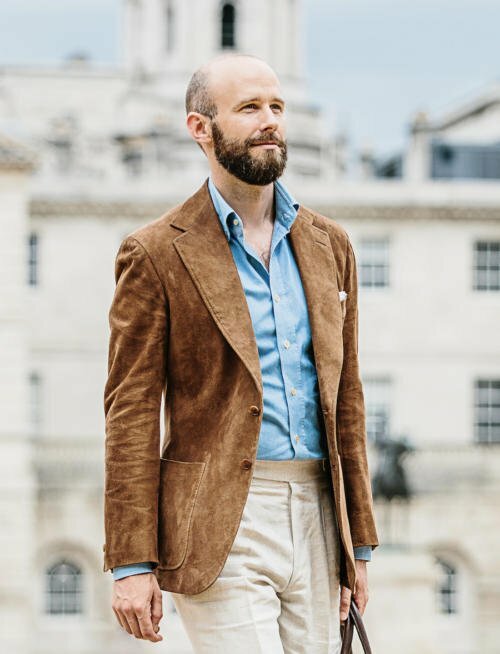 Having bought two lengths and had them made up from two different shirtmakers as button-downs, I couldn’t be happier with both the cloth and quality of the shirts from my makers. If anyone is thinking of purchasing the cloth and can afford this option, stopping thinking about it and make the purchase! You shouldn’t be disappointed. Do you look at this as a button down-only shirting? I imagine it might be nice as a relaxed dress shirt as well, perhaps with a knit or otherwise textured tie. What do you think (or have/plan yourself)? 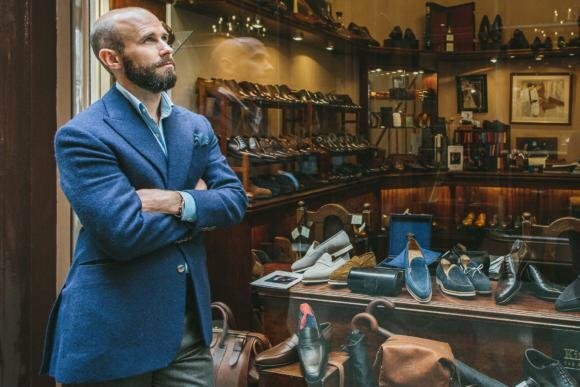 It can definitely be worn as a spread collar with a tie – that’s how my first one was, and I’m now trying to think which post that has been featured in! Thanks Simon – I found it making a camo appearance towards the end of the Budd shirt post.. tie still in hand though. Do all your spread collar shirts have no front placket? I think this one could look nice with one. Hi Simon. Planning to order a lenght of the denim cloth and asking Simone to make a shirt. 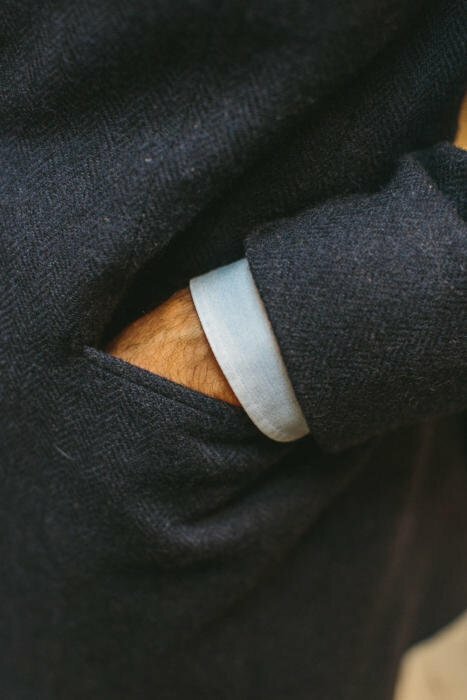 Quick question, what is the collar pint lenght of your spread collar shirts? Hi Simon, did your spread collar shirts have double cuffs? Is the fabric something you will continue to restock, or will this be done only sporadically? To echo J’s comment, I had a length of this fabric made into a button-down by Luca. It has aged and worn beautifully, garnering more positive comments than any other shirt I own. Off topic – sorry, but On the Cifonelli suede jacket, about which I am somewhat obsessed, would Sartoria Melina be able to produce something similar, and would they take measurements for such a commission at the pop up? Thanks. They don’t normally work in suede, so I’d have to check. The style would be slightly different, and it wouldn’t have the internal structure of a Cifonelli one (canvas etc, like a normal jacket). 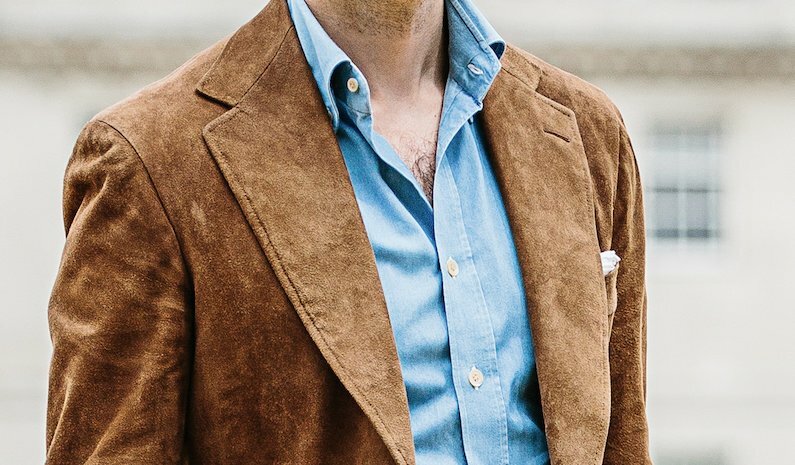 You’d basically be getting my Melina blazer, but in that shade of suede. Thanks Dieter. There shouldn’t be any functional difference between the two sides, other than perhaps less fade on the lighter side.